Of course, there are problems with the ancient interpretation that the Kenites were the descendants of Cain - according to the story of Noah, everyone but himself and his household died in the flood; thus, how did Cain's descendants survive? Unless of course one of his son's wives was a descendant of Cain? 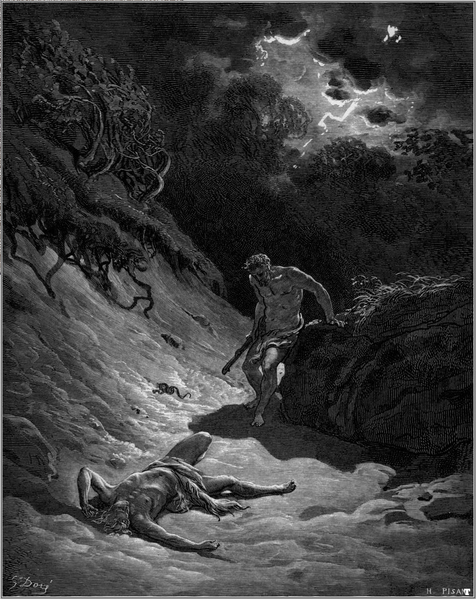 Or, as Kugel suggests, Cain was not originally meant to be the son of Adam and Eve - but that he was later incorporated into that part of the Bible. Why use the Hebrew word 'ish for "man" instead of the word for child? This word is never used to refer to children. Furthermore, a literal translation of the Hebrew says "I have gotten a man with the Lord." Because the word 'ish is also used to refer to angels, ancient interpreters concluded that, in this case, the word "Lord" referred to a wicked angel. Thus Cain's wickedness was explained. This is part of a series of posts for my upcoming Bible as Literature Group Read. To read the rest of my notes, go here. lol. Yeah, I guess that's exactly the problem. But in this case he's just plain evil.